If you are interested in the Civil War and have a few minutes, please stop by the Local History Room at the Dayton Metro Library (in the basement at Main). We currently have a case exhibit (well, three cases, actually) showcasing Civil War materials from the Dayton Collection. The exhibit will be up through the end of 2011. Last but certainly not least, you’ll notice the large album at the bottom of the photo. This album belonged to W. D. Bickham and contains cartes de visite he collected during the Civil War era, many depicting famous politicians and generals. For instance, the page currently open shows off a photo of none other than President Abraham Lincoln, plus Generals Winfield Scott, Philip Sheridan, and George Thomas (all 3 on the opposite page). The Bickham cartes de visite album is from the Bickham Collection (MS-017), which I processed. This was my first experience with this type of archival item. Obviously, I had seen cartes de visite before. I recognized them as a small, mid-19th-century type of albumen photograph. But as yet, I had only worked with family photo collections wherein all the cartes de visite were from friends or relatives. But this had to be something different; the majority of the images in the album are of famous people like Lincoln, Sheridan, Bragg, John Clem (aka Johnny Shiloh), just to name a few. While Bickham did have many famous (or later-famous) contacts due to his profession as a journalist, I seriously doubted that he had been given all of these photos personally. As it turns out, it was extremely common during that era for people to collect cartes de visite in a manner similar to how one might collect baseball cards. The National Museum of American History at the Smithsonian has an excellent blog post [“Civil War Portraits: Where Personal and Public Meet,” Oct. 3, 2011] discussing this practice. They also have a YouTube video [“Civil War Portraits: Personal and Public,” Sept. 25, 2011] to go along with it. This was a great help to me in understanding what I was actually looking at, in the case of the Bickham Album. I hope you’ll come down and see us and check out our exhibit. Although the Bickham Album is currently on display in a locked case, you can browse its contents online anytime on our Flickr page. I scanned each individual photo and added them to the set Bickham Civil War Album. There are several unidentified individuals — probably famous politicians or generals that I just don’t happen to recognize (we can’t all know everything!) — so if you see any marked unidentified and know who it is, please leave a comment to help us out. The Bickham Civil War Album is from the Bickham Collection (MS-017). The Howard Forrer photograph is from the Forrer-Peirce-Wood Collection (MS-018). Other items shown are from various parts of the Dayton Collection; contact librarian (i.e., me, or the library!) for info on specific items. Oh! 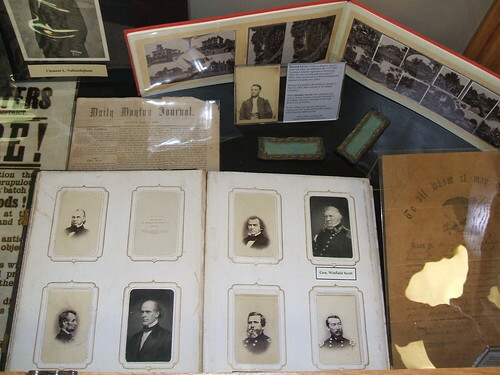 One more thing: Just so you know, I did not create this Civil War exhibit, although I did suggest the inclusion of the Bickham scrapbook and the Howard Forrer photo and shoulder boards. The majority of the exhibit (like, 99%!) was done by our lovely and talented Local History Specialist, Nancy Horlacher. The other two cases, which I have not photographed, include materials pertaining to the Dayton Soldiers’ Home and the 131st O.V.I. (a regiment made up primarily of men from Dayton). I recently wrapped up a project at work that I’ve been working on for a few weeks now: geo-tagging images of the 1913 Flood in Dayton, Ohio, using images on the Dayton Metro Library’s Flickr and a web site called GeoSlideShow, which creates the maps from geo-tagged images on Flickr. 1913 Flood “During” – This map shows images when the city was actually flooded. 1913 Flood “After” – Images on this map show the aftermath and clean-up in the city, including debris, mud, dead horses, crumbled buildings, and ruins from fires that broke out. I am very excited about having completed this project, because I think it is a great visual aid to understanding the flood and its history. It’s one thing to look at several (or in this case, hundreds) of photos of the flood and think, “Oh, how awful.” I think it’s more helpful to be able to contextualize those images in geographic space. Marking the photo’s location on a current map can help people understand, because they may be able to picture what’s there now or perhaps realize that maybe they drive by that spot every day and that in 1913 it was under water! All of the Dayton Metro Library’s 1913 flood pictures can be seen on Flickr, as well as in the library’s digital collections. This morning, I read this post from The Atlantic about a collection of Civil War photos added to Flickr by the Library of Congress. The photos look like they are all cased tintypes, many of them hand-colored…so very interesting. Flickr has a lof of neat ways to interact with content: comments, tags, mapping, and even groups. I was interested in a place where people from the Dayton area could share their local history photos and see others’ photos…and not finding one, I created one: History in the Miami Valley (Ohio). So far it has 19 members, and I only just created it last week. I am amazed at some of the photos people are sharing on Flickr — the way we are documenting the present, which years from now will amount to having documented the past. We have a wonderful collection like this at the library—the Lutzenberger photograph collection—full of pictures from the 1880s to 1930s. I always marvel at the way things used to look — especially the things that aren’t there anymore (and there are a lot of those!). It might seem silly to go out and take pictures of ordinary places and things, now, but in 100 years, people will look at those pictures the same way we look at pictures from 1900 today. I hope not only that these photos survive that long — oh the digital age! (but that’s for another entry) — but that some of them make it into a library or archives to be shared and studied by all.